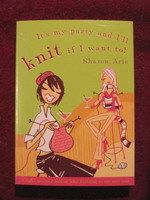 And now I got Sharon Aris' It's My Party and I Knit If I Want To. But are the knitting books fun to read? I really can't say. I would very much like to read about the history of knitting or learn new techniques and I do not know what to think about this light-hearted, fun approach. Am I boring? Am I dull? I guess I am. I guess I'm too involved with facts and practical texts that I feel like I cannot read and enjoy prose that easily anymore. Well, what the book tells us is that's it's trendy to knit and more and more people learn to knit (including people you wouldn't expect to do that). It handles the clichés "Knitting is the new feminism" and "Knitting is the new yoga" and tells about knitting circles, trendsetters, and knitters who have kept the craft alive. Also, there are Knit or Myth sections as well as Q&A sections where the author answers to questions with her tongue in cheeck, and of course there are some basic patterns. I also wonder who would be the first one to write this kind of a book in Finnish... Would it have readers? Would it be a best seller? Publishers, feel free to contact me and we'll figure out a deal!